EverBlock Systems today launched the EverBlock™ line of oversized modular plastic blocks. Each over-sized brick is designed to connect to adjacent bricks so that all types of objects and structures can be built. EverBlock's expert design-and-build duo, Ben MacKrell and Arnon Rosan, headed to the World Trade Center's 84th floor to assist in the installation of a life-size model hotel room earlier this May. The project team reviewing an overhead A/C unit concept. The project is for an upcoming renovation of a 1960's NYC landmark building (we'll be sure to tell you where as soon as we can! ), so it was only natural that the life-size rendering also took place in an iconic NYC building. And what a view! One World Trade certainly lives up to its impressive stature, inside and out. Construction on the site is set to begin this coming August, but until then, designs are not yet set in stone. So EverBlock was brought in to assist with the remodeling plans. While designs and layouts are finalized, the construction company, developers, and architects will be able to play and plan in a truly to-scale model of their projected hotel rooms. They can breakdown the block walls into various configurations; moving a HVAC column or doorway threshold from one place to another, creating single bedrooms, suites and more. All the stake holders were on site for the initial build. The plans were taped out on the floor and as Ben put it, they "colored between the lines" with the blocks, building a full bedroom, bathroom and hallway. Model furniture was laid out and moved around as well; bed frames and bathroom vanities repositioned at whim. The whole full scale build, with turns and curves and columns took under two hours to complete; a seemingly simple project for such extraordinary benefits. Now the engineering team involved will be able to fully immerse themselves in the actual, physical architecture and decor of the room to make the best possible decisions about design and function. This experiential prototype allows the planners to test different dimensions and get the full feeling of the space. It becomes easier to communicate different aspects of the architectural and structural design as well as envision decor and accent choices when working in true to size and not just miniature cardboard scale models. The existing architecture of the WTC played a role in the building of each space. Having windows with actual skyline views where the windows are meant to be in the hotel room, is a pretty cool feature! At the completion of the dry-run planning, EverBlock's team will head back to the WTC and disassemble the walls of blocks, pack them back on the pallets and ship back to the warehouse in the Bronx. The architects and development crews will take their finalized plans and go on to revamp this forgotten landmark back to the legendary status it deserves. The summer weather is not the only thing heating up at EverBlock Systems. Our customers and agents across the country and the globe have been busy building EverBlock creations that are H O T - H O T - H O T !!!!! Our customers state-side have been freshening up their homes with creative installations. EverBlock is so easy to use--you don't need tools or glue and you certainly don't need to be a rocket scientist to assemble your project! A couple of extra pairs of hands should do the trick--so call the kids, neighbors and even your Great-Aunt Sue! Though the household applications for EverBlock are limitless, we've also seen some creative and FUN designs built in commercial spaces as well. Citra Lighting in Ann Arbor, Michigan designed an elegant divider wall for their office space. Utilizing the staggered opening wall design and a few pops of color to highlight their corporate logo, they turned what could have been a boring necessity into a featured talking point! CrossFit Outbreak in Brooklyn, New York brought in EverBlock to create a much-deserved lounge area for their members. With a couple of thrones and a dual coffee table/ottoman in their iconic black and orange colors, CrossFit extended their coolness, from the weight room to the wait-ing room. Moving abroad, our agents and customers overseas have designed and built some brilliant constructions in the special event world. 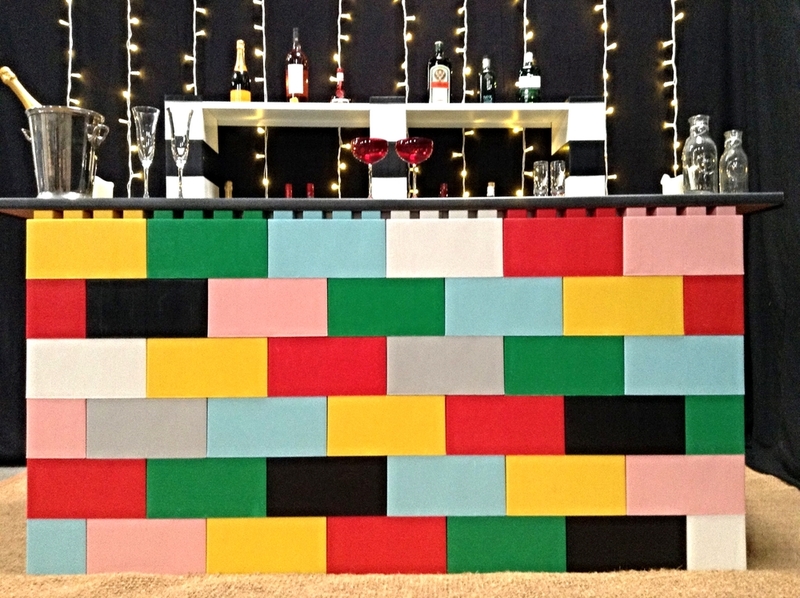 Our friends at EverBlock Hire in the UK, a division of Four Seasons Marquees, have designed impressive wet bars for parties and events. Illuminating our translucent blocks with LED lighting, they've heightened the nightlife experience. They've even played with a colorful brick pattern for a cheerful display with custom built bar racks behind using integrated EverBlock Shelving. In Singapore at the Shangri-La Hotel, custom catering buffet stands were built using EverBlock in a dramatic, architectural fashion. They combined design and function seamlessly, entertaining their guests with both the refreshments and the artistic displays as well. A littler further North in Japan, stunning, multi-unit reception counters were built for a large-scale professional event. EverBlock delivered quality design construction with an eye-popping twist of lettering in the facade. With EverBlock, the possibilities are truly endless. Build anything you can dream of. All it takes is a little IMAGINATION and INSPIRATION. Utilize different pattern layouts to achieve different styles. Update existing creations with new pops of color. Repurpose outdated pieces into something brand new and totally different! EverBlock is available globally and our reach is expanding each day. What will you build? See more block benefits from our friends at EverBlock Systems France! We certainly made a impact on guests with our grand entrance to the carnival, 10-foot high parapets and icy-white 20-foot long facade. Our team, with the help of Bank of America team members, built and built into the wee hours of Friday morning battling icy rain to finish this beauty! We used close to 1,200 of our Translucent blocks to complete this grandeur, lacing each of the four corner columns with LED light strips to illuminate the castle from within. Then, purple, blue, and pink flood lights were added along the base of the castle creating a brilliant colored glow. Guests arrived and were stunned! We heard a story of friends interacting with it: one went up and touched the walls and the other friend said "Is it cold?!" That's the effect the translucent blocks had. And the dusting of snow that arrived early Friday morning boosted the feeling. With EverBlock you get the best of both worlds, a seemingly made-of-ice castle with NO melting. Even in the snow-plentiful town of Lake George, the real ice castle took some damage from the warm sun. Not with EverBlock. This stood up to the elements and was a fun and interactive feature for all the guests to play in! It made for a great background for selfies and social media shots. You can find lots on Facebook, Instagram, and Twitter with the tag #wintercarnival. The big number was the Silent Disco that happened Saturday night. Guests listened to music on their light-up headphones with killer DJs playing the tunes on two channels. It was a great way to bring the park to life after hours! Lots of dancing and singing out loud, for sure, but the music was only on in the headphones. Must have been some sight for passers-by! In the end, the Winter Carnival was a huge success and a super, fun-packed weekend in NYC for residents and tourists alike. EverBlock was a great solution for the ice castle and with a turn-key rental and install, we set it up and broke it down before anyone knew what hit 'em! Don't miss out next year, we're sure to be BIGGER and BETTER! Happy wintertime and keep building! Just in time for the holiday season, EverBlock founder and president Arnon Rosan and colleague Ben Mackrell headed for Washington DC to assist in the resurrection of the 17 feet tall candelabra in front of the National Synagogue. Though this may look like a Menorah to most people, the giant modular construction is technically called a “Chanukiah” because it has 8 candle holders PLUS the slightly taller center candle called the “Shamash,” which is traditionally used to light the other 8 candles on their respective nights during Chanukah. After a couple of dry runs at the EverBlock factory in the Bronx, NY, the team was ready to recreate the oversized modular work of art on the steps of the National Synagogue. They had an assembly of help as children from the Jewish Primary Day School, led by Rabbi Shmuel Herzfeld, came to participate in the building project. It was a fun, educational, and meaningful project for the kids to take part in and the team was more than glad to have the extra, tiny sets of hands passing blocks up, up, and up as they built to the top! The iconic Chanukiah was built using nearly 700 Blocks in all the different sizes: Full 12” x 6”, Half 6” x 6”, Quarter 3” x 6” and finishing caps. It is topped off with remote controlled candles so that it can come to life during the eight day festival. Reinforced throughout with wooden dowels for added strength and built with a substantial interlocking base, the structural integrity of the Chanukiah is ready for all types of whatever December weather Washington DC can to throw at it. Makers, artists, crafters, engineers, tech junkies, and DIY enthusiasts from all over the globe united for one slam-packed weekend showcasing the best and brightest innovators and their creations at the New York Hall of Science in Flushing, Queens on September 26th and 27th. The New York Maker Faire draws in tens of thousands of attendees to see new releases from pioneers like: Microsoft, Google, and Netflix. But it also welcomes new comers to game in what they call the “Startup Zone,” which is where EverBlock Systems had a brightly built booth made from none other, but….EverBlocks. With a few blocks to spare, the mini makers in attendance got busy working on all sorts of creations. No amount of dust could keep them away from using their imaginations and building life-size constructions! It was easy to see the wheels churning, working out the technical (yet fun) aspects of engineering with EverBlock. After a fun-filled and inspiring two days of “Hey I saw you guys on the web! Here they are in real life!” we were happy to share the blocks with some of the attendees who stayed until the very end; a great way to recycle our booth and join in the GREEN theme of the weekend.